Now before you get too happy with that score you'll have to remember that's just a tally for last week. The previous weeks pretty much all went Syncrude's way. In fact before last week's ruling that Syncrude Canada Ltd. was legally responsible for the death of 1,606 ducks on one of its tailings ponds, they were having it all their own way. By my count it's about 3,761 - 1 in Syncrude's favour. But there's hope. For example Syncrude alone releases 245 tonnes of sulphur dioxide a day. Five Percent of Canada's greenhouse gas emissions are produced by Alberta's tarsands. It is Canada's fastest growing source of carbon dioxide. By 2020 the tarsands will account for 16 per cent of the nation's total emissions. 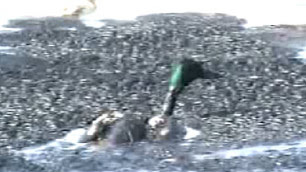 For killing those ducks, the maximum fine they face for this is $800,000. Chump change in the world of bigoil profits. Plus they still have the freedom to pollute and degrade the environment all they want. It's not as if anyone in Canadian politics has the courage to stand up to them.